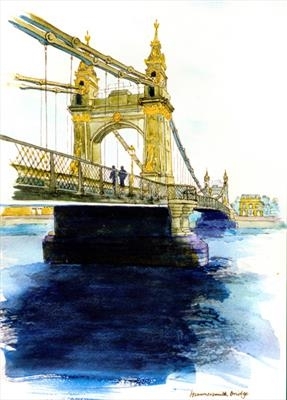 Pen and wash illustration of Hammersmith Bridge, used for a greetings card and giclée prints and many sold. Original gifted to Mr T. Cooley. Available as olimited edition 95 Giclée prints for £120 with certificate of authentication. This pen and water colour wash was originally painted for publication of a greetings card sold very successfully in it's 100's - mostly in the West London area. It attracts regular orders as a Giclée print on Bockingford water colour Art paper. The original is owned by my nephew Mr. Tim Cooley.